HiMark was the best possible place we could have had our wedding. The room was absolutely beautiful. There are lights and tule that run the ceiling, icicle light above and below the head table underneath white fabric, and an arch that we used being the cake with white tule and lights. It was perfect! They have so many different things that they provide including champagne glasses, all kinds of centerpieces, cake stands, punch glasses/bowl, teal light candles, etc. We were not able to do the set up ourselved because there was an event the night before our wedding. I was very nervous about this because I didn't have the control over making the room look exactly how I wanted. After meeting with Kinsey (the event manager) I felt I could trust her. And she did an absolutely wonderful job. I cannot thank her enought for making the room look perfect and just like I wanted. I came in the morning of the wedding to make sure everything was good, and I didn't have to change a thing! We brought all of our items to her the Thursday before, and that's when we discussed the set up. We set up one table and she took pictures so she knew exactly what to do. We also discussed where our colored tule would be placed as well as the guestbook table and head table set up. She had great suggestions for these when I wasn't exactly sure what would look best. Kinsey was the best person we could have had...she far exceeded my expectations. During the reception she actually carried my plate of food back to my seat and got cake for my husband and I. She was focused on making us happy. When we arrived at the reception she even helped get my veil off and put up my dress bussel....so great! For dinner we chose to have a pork, country style green beans, mashed potatoes and gravy, and tossed salad. Rolls came with all of this. The food is what we have gotten the most comments on. One friend said they've been to a lot of wedding the past few summers and it was his favorite dinner. Someone even asked for the recipe of the gravy! Everything was delicious! The cost of the food was actually cheaper than I thought it would be. So things are definitely reasonably priced. There was a room charge, but not an exceptional amount so everything was definitely worth the money we spent. We used drink tickets for the bar which went very well. I could not have asked for a more wonderful reception venue! They had so many wonderful decorations that I was allowed to use and the reception hall manager set up all the centerpieces for me! We were also allowed to take pictures on the golf course which was wonderful. 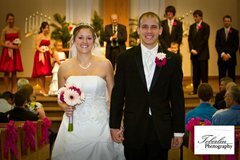 The reception hall manager truly helped make our day go smoothly and I would highly recommend HiMark. Great value for a great price! Beautiful setting for your photos and reception. Kinsey was great to work with.